It was been a long few days back in Michigan with leaving Tuesday evening, getting accessed, needing platelets, getting letter to Emily's teacher for the parents, bone marrow, needing blood, MIBG/CT scan, and talking with Sholler. But we made it through it. Emily is so strong and amazing and we watch her as she gets accessed and she is taking it so well and we are so proud of her. She was so strong when she had to go for her bone marrow and she was again amazing for taking it like a big girl. Handling the MIBG/CT scan although her toes were bothering her, but she did it and we were so proud of her. How can you not be proud of a 5 year old little girl fighting, fighting so strong to be all that she can be. She makes her dad and I so proud, so proud to be her parents. 7 spots, only 3 spots are left and 2 of those spots are almost gone and the last one is getting smaller. This is amazing. The spots that were on her skull and 2 on her spine and 1 of her femurs is gone, they are gone. We have never seen such amazing change since we have started this whole ordeal. While we previously reported Emily was clear from the scans from VCU, we knew that these scans were not optimal as the ones in Michigan. A regular MIBG scan to a fused MIBG/CT scan is a bit different. A regular MIBG scan you can only see the top and bottom of the body, where as the MIBG/CT scan , the two are fused together, and you have a 360 angle view and 3D. The technology is amazing. After Dr Sholler looked at the scan from VCU she can see how the scan was considered clear, however from doing the 360 angle 3D, you can see right down the middle and actually see the spots. So what does this mean? Currently there isn't antibodies available, such as CH14.18 or HU14.18. We truly believe that this will clear her and keep her in remission forever. We want to to get her there. At one point it was said we could do Sloans 3F8 which if we wanted to set up a consulation we could, but we really didn't want to go 3F8 unless we had to. After Dr. Sholler reviewed the scans, she feels that Emily is having excellent response from the Nifurtimox Trial and she said have another 1 to 2 rounds of it along with the Zometa and melatonin. We did explain all the bone pain that Emily experienced during round 5 when she had the Zometa and I asked her how can we stay on top of it? She said I can give you a prescription of Decadron and you can give it to her at the start of the pain and that should help. I asked her about platelets taking longer and longer to recover. She said what we can do is instead of 5 days of the chemo is do 4 days, so on the 5th day she would actually receive the neulasta. Because we finished the 6 round trial, we are not required to follow it to a "t", so we can work around things and do what works. So we will do the nifurtimox 3 times a day again, along with 4 days of chemo, zometa on first day and the melatonin at night. Also because the 6 round trial is complete, she doesn't have to start next week, she can go to school and enjoy being a kid and go to school and meet her friends, enjoy being a "normal" kid in school, this is what we want her to do, she deserves this. While we were there, we asked her if Emily would qualify for compassionate use of CH14.18 and she said she would call and find out, but felt that she could work it out and if they approved it, we could do it right at our home hospital and would only need to come to Michigan for scans as we are already doing. While talking with her, she said you know let me call while we are sitting together. She called and has already starting making connections and will see what she can do, but that it would take a couple of weeks. So, we are hoping to hear from her soon that she made the connection and they are going to allow Emily to get the CH14.18. Tonight we were watching the Stand Up to Cancer that was on. It was amazing that they talked about Childhood Cancer, and one of them was about Neuroblastoma. Childhood Cancer needs the awareness and this is amazing. The amazing Taylor Swift sang a song called "Ronan" about Ronan Thompson who passed from Neuroblastoma. Have you purchased this on iTunes yet? All proceeeds will go to Childhood Cancer Research. Ronan is currently number 2 on iTunes, and we want to see it make it to number 1. During the show Emily said, "Mom do I have cancer?" I wasn't really sure what to say, so I looked at Doug and said help me, he said just answer her. I said, "Emily, what do you think neuroblastoma is?" Emily said, "Cancer!" Tears started to swell in the eyes and I could see Doug's face, but we followed her lead to see if she had any other questions. She didn't question anything, so we moved forward. Emily is really looking forward to starting school next week, so Monday is a big day for her. Her platelets are low, so she won't be able to do recess, or anything wild and crazy, and Tuesday morning she will have clinic to check her counts to make sure everything is looking ok. We are really excited about her starting, but extremely nervous but aren't all parents when their kids first start kindergarden? Yes they are. Emily will do fantastic. The Monkey in my Chair has been great for the kids at Crenshaw so they know they have another member of the class, and know when the monkey is there that Emily will not be there. The monkey goes with them wherever they go, so I think this is great for the kids and for Emily. Today the Education Liason came to talk with the students about Emily. We are not really sure how it went, but we imagine that it went well and we are happy that she went out to do that and talk with the students about Emily. To all the parents of Emily's classmates, we are open to any questions that you may have, just please let us know. So, here is where we stand. We are very happy with the outcome, and feel that Emily is going to make a full recovery, while we still have a long road ahead of ourselves, she is doing amazing right now, and her weight is looking great right now too. We hope that this next round or 2 of the Nifurtimox trial knocks the 3 spots out and off to CH14.18. I cannot help tearing up at such excellent news!!! God is so good!!!! This is fantastic news!!! Praise GOD! I'm so happy for all of you! 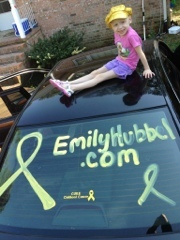 Continuing to pray and pray for you Emily. Wonderful news! So happy to hear this! Keep up the great work Emily!!! How great this news is!! Emily have a great first day at school, I can't wait to tell Alex he will be so excited that you are in school. You are doing great. Shannon and Doug you are our heroes as well as Emily, your amazing strength and love is amazing. We love you all!